This article is about the Rijksmuseum in Amsterdam. 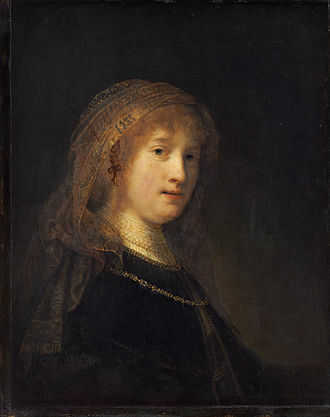 For other national museums in the Netherlands, see List of Rijksmuseums. The Rijksmuseum (Dutch pronunciation: [ˈrɛiksmyˌzeːjʏm]; English: National Museum) is a Dutch national museum dedicated to arts and history in Amsterdam. The museum is located at the Museum Square in the borough Amsterdam South, close to the Van Gogh Museum, the Stedelijk Museum Amsterdam, and the Concertgebouw. The Rijksmuseum was founded in The Hague in 1800 and moved to Amsterdam in 1808, where it was first located in the Royal Palace and later in the Trippenhuis. The current main building was designed by Pierre Cuypers and first opened in 1885. On 13 April 2013, after a ten-year renovation which cost € 375 million, the main building was reopened by Queen Beatrix. In 2013 and 2014, it was the most visited museum in the Netherlands with record numbers of 2.2 million and 2.47 million visitors. It is also the largest art museum in the country. The museum has on display 8,000 objects of art and history, from their total collection of 1 million objects from the years 1200–2000, among which are some masterpieces by Rembrandt, Frans Hals, and Johannes Vermeer. The museum also has a small Asian collection, which is on display in the Asian pavilion. In 1795, the Batavian Republic was proclaimed. 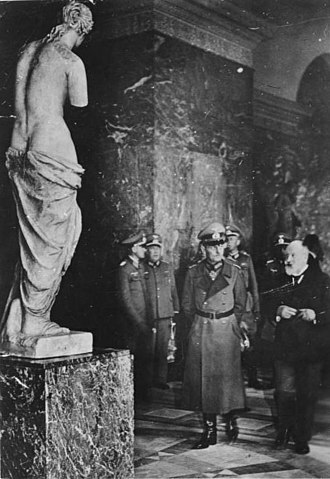 The Minister of Finance Isaac Gogel argued that a national museum, following the French example of The Louvre, would serve the national interest. On 19 November 1798, the government decided to found the museum. On 31 May 1800, the National Art Gallery (Dutch: Nationale Kunst-Galerij), precursor of the Rijksmuseum, opened in Huis ten Bosch in The Hague. The museum exhibited around 200 paintings and historic objects from the collections of the Dutch stadtholders. In 1805, the National Art Gallery moved within The Hague to the Prince William V Gallery, on the Buitenhof. 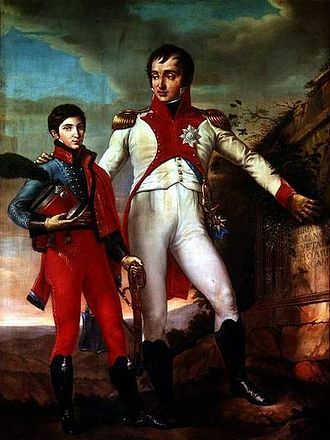 In 1806, the Kingdom of Holland was established by Napoleon Bonaparte. 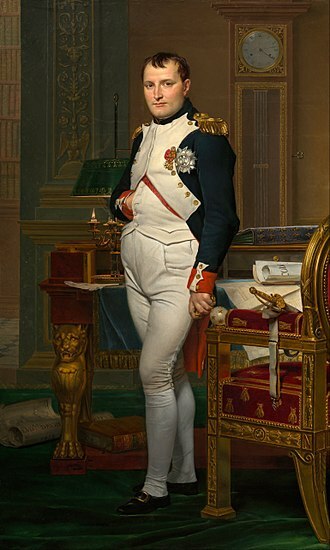 On the orders of king Louis Bonaparte, brother of Napoleon, the museum moved to Amsterdam in 1808. 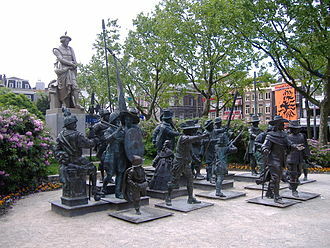 The paintings owned by that city, such as The Night Watch by Rembrandt, became part of the collection. 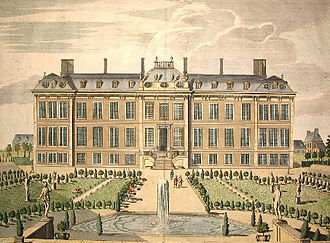 In 1809, the museum opened in the Royal Palace in Amsterdam. 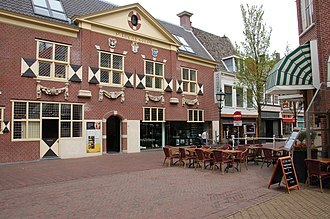 In 1817, the museum moved to the Trippenhuis. The Trippenhuis turned out to be unsuitable as a museum. In 1820, the historical objects were moved to the Mauritshuis in The Hague and in 1838, the 19th-century paintings "of living masters" were moved to king Louis Bonaparte's former summer palace Paviljoen Welgelegen in Haarlem. "Did you know that a large, new building will take the place of the Trippenhuis in Amsterdam? That’s fine with me; the Trippenhuis is too small, and many paintings hang in such a way that one can’t see them properly." – Vincent van Gogh in a letter to his brother Theo in 1873. 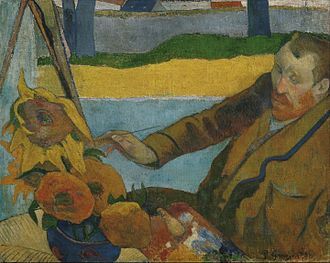 Vincent himself would later become a painter and some of his works would be hanging on the museum. In 1863, there was a design contest for a new building for the Rijksmuseum, but none of the submissions was considered to be of sufficient quality. Pierre Cuypers also participated in the contest and his submission reached the second place. In 1890, a new building was added a short distance to the south-west of the Rijksmuseum. As the building was made out of fragments of demolished buildings, the building offers an overview of the history of Dutch architecture and has come to be known informally as the 'fragment building'. It is also known as the 'south wing' and is currently (in 2013) branded the Philips Wing. In 1906, the hall for the Night Watch was rebuilt. In the interior more changes were made between the 1920s and 1950s - most multi-coloured wall decorations were painted over. In the 1960s exposition rooms and several floors were built into the two courtyards. The building had some minor renovations and restorations in 1984, 1995–1996 and 2000. A renovation of the south wing of the museum, also known as the 'fragment building' or 'Philips Wing', was completed in 1996, the same year that the museum held its first major photography exhibition featuring its extensive collection of 19th-century photos. In December 2003, the main building of the museum closed for a major renovation. During this renovation, about 400 objects from the collection were on display in the 'fragment building', including Rembrandt's The Night Watch and other 17th-century masterpieces. The restoration and renovation of the Rijksmuseum are based on a design by Spanish architects Antonio Cruz and Antonio Ortiz. Many of the old interior decorations were restored and the floors in the courtyards were removed. The renovation would have initially taken five years, but was delayed and eventually took almost ten years to complete. 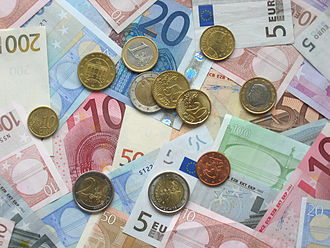 The renovation cost € 375 million. The reconstruction of the building was completed on 16 July 2012. In March 2013, the museum's main pieces of art were moved back from the 'fragment building' (Philips Wing) to the main building. The Night Watch returned to the Night Watch Room, at the end of the Hall of Fame. On 13 April 2013, the main building was reopened by Queen Beatrix. On 1 November 2014, the Philips Wing reopened with the exhibition Modern Times: Photography in the 20th Century. The building of the Rijksmuseum was designed by Pierre Cuypers and opened in 1885. It consists of two squares with an atrium in each centre. In the central axis is a tunnel with the entrances at ground level and the Gallery of Honour at the first floor. The building also contains a library. The fragment building, branded Philips wing, contains building fragments that show the history of architecture in the Netherlands. 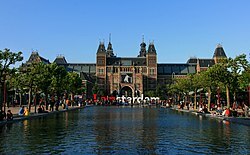 The Rijksmuseum is a rijksmonument (national heritage site) since 1970 and was listed in the Top 100 Dutch heritage sites in 1990. The Asian pavilion was designed by Cruz y Ortiz and opened in 2013. According to Muriel Huisman, Project Architect for the Rijksmuseum's renovation, "Cruz y Ortiz always like to look for a synergy between old and new, and we try not to explain things with our architecture.” With the Rijks, “there’s no cut between old and new; we’ve tried to merge it. We did this by looking for materials that were true to the original building, resulting in a kind of silent architecture." The Rijksmuseum was located in the Trippenhuis between 1817 and 1885. Drawing of the design by Pierre Cuypers in 1876. Front of Cuypers' building, circa 1895. View of the facade by night. 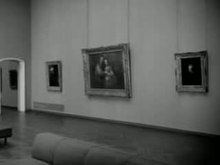 Video of the Rijksmuseum (2016). The collection of the Rijksmuseum consists of 1 million objects and is dedicated to arts, crafts, and history from the years 1200 to 2000. Around 8000 objects are currently on display in the museum. The collection contains more than 2,000 paintings from the Dutch Golden Age by notable painters such as Jacob van Ruisdael, Frans Hals, Johannes Vermeer, Jan Steen, Rembrandt, and Rembrandt's pupils. The museum also has a small Asian collection which is on display in the Asian pavilion. It also displays the stern of HMS Royal Charles which was captured in the Raid on the Medway, and the Hartog plate. In 2012, the museum took the unusual step of making some 125,000 high-resolution images available for download via its Rijksstudio webplatform, with plans to add another 40,000 images per year until the entire collection of one million works is available, according to Taco Dibbits, director of collections. The 20th-century visitor record of 1,412,000 was reached in the year 1975. In the 1990s and early 2000s, the Rijksmuseum was annually visited by 0.9 to 1.3 million people. On 7 December 2003, the main building of the museum was closed for a renovation until 13 April 2013. In the preceeding decade, the number of visitors had slightly decreased to 0.8 to 1.1 million people. The museum says after the renovation, the museum's capacity is 1.5 to 2.0 million visitors annually. Within eight months since the reopening in 2013, the museum was visited by 2 million people. The museum had 2.2 million visitors in 2013 and reached an all-time record of 2.47 million visitors in 2014. 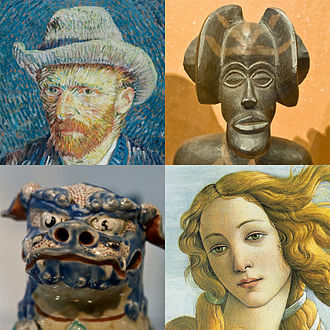 The museum was the most visited museum in the Netherlands and the 19th most visited art museum in the world in 2013 and 2014. The Rijksmuseum Research Library is part of the Rijksmuseum, and is the best and the largest public art history research library in The Netherlands. Rijks, stylized as RIJKS®, is a restaurant with 140 seats in the Philips Wing. Joris Bijdendijk has been the chef de cuisine since the opening in 2014. The restaurant was awarded a Michelin star in 2017. ^ This includes the 16,777 visitors to the main building. ^ In 1993, the visitors number had decreased with 23% to 936,400, i.e. there were approximately 1,216,103 visitors in 1992. ^ The main building was closed from 7 December 2003. ^ In 1995, the visitor number had decreased with 60,000 to 942,000, i.e. there were approximately 1,002,000 visitors in 1994. ^ a b Address and route, Rijksmuseum. Retrieved 4 April 2013. ^ a b c d e f g h i History of the Rijksmuseum, Rijksmuseum. Retrieved 4 April 2013. ^ a b c d e f g The renovation, Rijksmuseum. Retrieved on 4 April 2013. ^ a b (in Dutch) Jasper Piersma, "Van Gogh Museum zit Rijks op de hielen als populairste museum", Het Parool, 2016. Retrieved 2 January 2016. ^ a b Jaarverslag 2015 (in Dutch), Rijksmuseum. Retrieved 23 January 2017. ^ a b c d Jaarverslag 2014 (in Dutch), Rijksmuseum. Retrieved 23 January 2017. ^ a b (in Dutch) Claudia Kammer & Daan van Lent, "Musea trokken dit jaar opnieuw meer bezoekers", NRC Handelsblad, 2014. Retrieved on 18 July 2015. ^ a b Top 100 Art Museum Attendance, The Art Newspaper, 2015. Retrieved on 18 July 2015. ^ a b Board of Directors, Rijksmuseum. Retrieved 4 April 2013. ^ "The beginning". History of the Rijksmuseum. Rijksmuseum. Retrieved 2 February 2018. ^ Museumplein Archived 13 August 2012 at the Wayback Machine, I Amsterdam. Retrieved 4 April 2013. ^ a b "Rijksmuseum set for grand reopening in Amsterdam". BBC News. 4 April 2013. Retrieved 4 April 2013. ^ a b "The Rijksmuseum reopens: A new golden age". The Economist (London). 13 April 2013. Retrieved 14 April 2013. ^ "The Dutch Prize Their Pedal Power, but a Sea of Bikes Swamps Their Capital". The New York Times. 20 June 2013. ^ a b c d Jaarverslag 2013 (in Dutch), Rijksmuseum. Retrieved 23 January 2017. ^ a b (in Dutch) Roelof van Gelder, Schatkamer met veel gezichten, 2000. Retrieved 15 April 2013. ^ "To Theo van Gogh. The Hague, Tuesday, 28 January 1873". Retrieved 24 March 2018. ^ a b c "Stadhouderskade 42. Rijksmuseum (1876/85)". Monumenten en Archeologie in Amsterdam (in Dutch). City of Amsterdam. Archived from the original on 9 February 2007. Retrieved 1 April 2007. ^ "Stadhouderskade 42. Rijksmuseum (1876/85). Interieur". Monumenten en Archeologie in Amsterdam (in Dutch). City of Amsterdam. Archived from the original on 2 February 2007. Retrieved 1 April 2007. ^ "Final Design The New Rijksmuseum". The New Rijksmuseum. Rijksmuseum Amsterdam. Archived from the original on 19 September 2009. Retrieved 1 April 2007. ^ Jan Willem Pieneman Archived 24 April 2016 at the Wayback Machine, Rijksmuseum. Retrieved 2 May 2013. ^ (in Dutch) Frederik Daniël Otto Obreen (1840-96) Archived 3 November 2013 at the Wayback Machine, Rijksmuseum. Retrieved 2 May 2013. ^ (in Dutch) Jonkheer Barthold Willem Floris van Riemsdijk (1850-1942), Geheugen van Nederland. Retrieved 25 April 2013. ^ (in Dutch) A.A.M. de Jong, Schmidt Degener, Frederik (1881-1941), Historici.nl, 2012. Retrieved 25 April 2013. ^ (in Dutch) Th.J. Meijer, Röell, jhr. David Cornelis (1894-1961), Historici.nl, 2012. Retrieved 25 April 2013. ^ a b (in Dutch) Lucette ter Borg, "Gedonderjaag in het Rijksmuseum", de Volkskrant, 2000. Retrieved 25 April 2013. ^ "CV Prof. Dr. (h. c.) Ronald de Leeuw" (PDf). Kunsthistorisches Museum. Retrieved 25 April 2013. ^ Charlotte Higgins (5 April 2013). "Rijksmuseum to reopen after dazzling refurbishment and rethink". The Guardian (London). Retrieved 25 April 2013. ^ (in Dutch) Monumentnummer: 5680, Rijksdienst voor het Cultureel Erfgoed. Retrieved on 6 March 2014. ^ "Rijksmuseum lanceert Rijksstudio". Creative Commons Nederland (in Dutch). Retrieved 30 July 2015. ^ Rijkstudio promotes and enables the reuse of the Rijksmuseum collection. ^ Nina Siegal (28 May 2013). "Masterworks for One and All". The New York Times. Retrieved 28 May 2013. ^ Erik Boekesteijn (12 April 2013). TWIL #94: Peter Gorgels (Internet Manager Rijksmuseum) (Video podcast). This Week In Libraries. Amsterdam: Shanachiemedia. Archived from the original on 20 July 2013. Retrieved 11 June 2013. ^ a b (in Dutch) Openingsjaar Rijksmuseum breek alle records Archived 28 December 2013 at the Wayback Machine, Rijksmuseum, 2013. Retrieved on 2013-12-27. ^ a b c (in Dutch) Jaarverslag 2001, Rijksmuseum, 2002. Retrieved 25 April 2013. ^ a b c d e f g (in Dutch) Jaarverslag 2011, Rijksmuseum, 2012. Retrieved on 25 April 2013. ^ a b (in Dutch) "Museumbezoek in 1993 sterk gedaald", NRC Handelsblad, 1994. Retrieved 21 November 2016. ^ a b c (in Dutch) Jaarverslag 2003, Rijksmuseum, 2004. Retrieved 25 April 2013. ^ a b Jaarverslag 2012 (in Dutch), Rijksmuseum. Retrieved 23 January 2017. ^ (in Dutch) "Nieuwe musea hadden in 1995 een goede start", de Volkskrant, 1996. Retrieved 21 November 2016. ^ a b (in Dutch) "Grote musea trokken in 1995 minder bezoekers", Trouw, 1996. Retrieved 21 November 2016. ^ a b c (in Dutch) Jaarverslag 2005, Rijksmuseum, 2006. Retrieved 25 April 2013. ^ (in Dutch) Rijksmuseum en Kunsthal trekken veel bezoekers, de Volkskrant, 1997. Retrieved 25 April 2013. ^ (in Dutch) Jaarverslag 1998, Rijksmuseum, 1999. Retrieved 25 April 2013. ^ a b (in Dutch) Jaarverslag 1999, Rijksmuseum, 2000. Retrieved 25 April 2013. ^ Rijksmuseum welcomes two millionth visitor (press release), Rijksmuseum, 2013. Retrieved 27 December 2013. ^ Top 100 Art Museum Attendance, The Art Newspaper, 2014. Retrieved on 28 June 2014. ^ Brooke Bobb, "Go for the Art, Stay for the Food: The 7 Best Museum Restaurants Around the World", Vogue, 2016. Retrieved 10 January 2017. ^ "Joris Bijdendijk verantwoordelijk voor nieuwe restaurant Rijksmuseum", Het Parool, 2014. Retrieved 10 January 2017. ^ "Michelinster voor Amsterdamse restaurants Rijks, Bolenius en Mos", Het Parool, 2016. Retrieved 10 January 2017. Beatrix reigned as Queen of the Netherlands from 1980 until her abdication in 2013, after a reign of exactly 33 years. Beatrix is the eldest daughter of Queen Juliana and her husband, upon her mothers accession in 1948, she became heir presumptive. Beatrix attended a primary school in Canada during World War II. In 1961, she received her law degree from Leiden University, in 1966, Beatrix married Claus von Amsberg, a German diplomat, with whom she had three children. When her mother abdicated on 30 April 1980, Beatrix succeeded her as queen, on Koninginnedag,30 April 2013, Beatrix abdicated in favour of her eldest son, Willem-Alexander, and resumed the title of princess. At the time of her abdication, Beatrix was the oldest reigning monarch of the Netherlands, Beatrix was born Princess Beatrix Wilhelmina Armgard of the Netherlands, Princess of Orange-Nassau, Princess of Lippe-Biesterfeld, on 31 January 1938 at the Soestdijk Palace in Baarn, Netherlands. She is the first child of Princess Juliana of the Netherlands, Beatrix was baptized on 12 May 1938 in the Great Church in The Hague. Beatrixs middle names are the first names of her grandmother, the reigning Queen Wilhelmina. When Beatrix was one old, in 1939, her younger sister Princess Irene was born. World War II broke out in the Netherlands on 10 May 1940, on 13 May, the Dutch Royal Family evacuated to London, United Kingdom. One month later, Beatrix went to Ottawa, Canada, with her mother Juliana and her sister Irene, while her father Bernhard, the family lived at the Stornoway residence. With bodyguards and ladies in waiting, the family summered at Bigwin Inn on Lake of Bays, while on Bigwin Island, the constitution of the Netherlands was stored in the cast iron safe of Bigwin Inns Rotunda building. In order to them with a greater sense of security, culinary chefs. Upon their departure, the musicians of the Bigwin Inn Orchestra assembled dockside, and at every public performance afterward through to the end of World War II. In the years following the shuttering and neglect of the island resort, the second sister of Beatrix, Princess Margriet, was born in Ottawa in 1943. Frans Hals the Elder was a Dutch Golden Age portrait painter who lived and worked in Haarlem. He is notable for his loose painterly brushwork, and he helped introduce this style of painting into Dutch art. Hals played an important role in the evolution of 17th-century group portraiture, Hals was born in 1582 or 1583 in Antwerp as the son of cloth merchant Franchois Fransz Hals van Mechelen and his second wife Adriaentje van Geertenryck. Like many, Hals parents fled during the Fall of Antwerp from the Spanish Netherlands to Haarlem, Hals studied under Flemish émigré Karel van Mander, whose Mannerist influence, however, is barely noticeable in Hals work. In 1610, Hals became a member of the Haarlem Guild of Saint Luke and he worked on their large art collection that Karel van Mander had described in his Schilderboeck published in Haarlem in 1604. 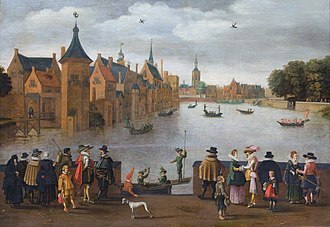 The most notable of these were the works of Geertgen tot Sint Jans, Jan van Scorel, the entire collection of paintings was not formally possessed by the city council until 1625, after the city fathers had decided which paintings were suitable for the city hall. 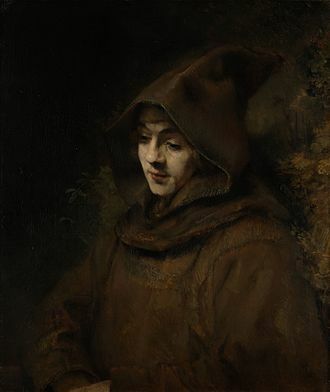 The remaining art that was considered too Roman Catholic was sold to Cornelis Claesz van Wieringen and it was in this cultural context that Hals began his career in portraiture, since the market had disappeared for religious themes. The earliest known example of Hals art is the portrait of Jacobus Zaffius and his breakthrough came with the life-sized group portrait The Banquet of the Officers of the St George Militia Company in 1616. His most noted portrait today is the one of René Descartes which he made in 1649, Frans Hals married his first wife Anneke Harmensdochter around 1610. Frans was of Catholic birth, however, so their marriage was recorded in the city hall, the exact date is unknown because the older marriage records of the Haarlem city hall before 1688 have not been preserved. Bavochurch where both are buried, though Frans took over 40 years to join his first wife there, Anneke died in 1615, shortly after the birth of their third child and, of the three, Harmen survived infancy and one had died before Hals second marriage. Amsterdam-Zuid is a borough of Amsterdam, Netherlands. The borough was formed in 2010 as a merger of the former boroughs Oud-Zuid, the borough has almost 138,000 inhabitants. With 8,500 homes per square kilometer, it is one of the most densely populated boroughs of Amsterdam and it has the highest income per household of all boroughs in Amsterdam. Amsterdam-Zuid is the borough of Amsterdam situated to the south and southwest of the Singelgracht canal, the Singelgracht canal had been Amsterdams city border since the 17th century, when the Amsterdam canal belt was constructed. The taking down of the surrounding the Singelgracht, the outer canal. South of the wall, the first neighborhoods to develop were the Oude Pijp neighborhood, the neighborhood surrounding the Rijksmuseum. This area is now known as Oud Zuid. In 1917, the area was further developed southwards on the basis of Plan Zuid, berlages plan included wide streets lined with four-story apartment blocks for the middle class. The plan included public art to be installed in the new residential areas, between 1920 and 1940, the Plan Zuid neighborhoods of Nieuwe Pijp, Rivierenbuurt and Apollobuurt were constructed, with many buildings designed in Amsterdam School style. This area is known as Nieuw Zuid. Another neighborhood built in the 1920s is the Hoofddorppleinbuurt, west of the Schinkel river and this neighborhood is part of Plan West, another urban expansion plan by Berlage which was designed for the western area of the city on the territory of the former municipality of Sloten. In the 1950s and 1960s, the Buitenveldert neighborhood and the smaller Prinses Irenebuurt became the last major developments in the southern part of the city. In 1961, the Amsterdam RAI Exhibition and Convention Centre opened, the A10 motorway, which runs through the southern borough, was constructed in 1962. In 1978, the first section of the Weesp–Leiden railway and the Amsterdam Zuid railway station opened along the part of the A10 motorway. In the 1990s and 2000s, the surrounding the railway station became the rapidly developing business district of Zuidas. Since the 2014 municipal elections, the councils have been abolished and replaced by smaller. The district committees are elected every four years, on the day as the citys central municipal council. History is the study of the past as it is described in written documents. Events occurring before written record are considered prehistory and it is an umbrella term that relates to past events as well as the memory, collection, organization and interpretation of information about these events. Scholars who write about history are called historians and their works continue to be read today, and the gap between the culture-focused Herodotus and the military-focused Thucydides remains a point of contention or approach in modern historical writing. In Asia, a chronicle, the Spring and Autumn Annals was known to be compiled from as early as 722 BC although only 2nd-century BC texts survived. Ancient influences have helped spawn variant interpretations of the nature of history which have evolved over the centuries, the modern study of history is wide-ranging, and includes the study of specific regions and the study of certain topical or thematical elements of historical investigation. Often history is taught as part of primary and secondary education, the word history comes ultimately from Ancient Greek ἱστορία, meaning inquiry, knowledge from inquiry, or judge. It was in that sense that Aristotle used the word in his Περὶ Τὰ Ζῷα Ἱστορίαι, the ancestor word ἵστωρ is attested early on in Homeric Hymns, the Athenian ephebes oath, and in Boiotic inscriptions. History was borrowed from Latin into Old English as stær, and it was from Anglo-Norman that history was borrowed into Middle English, and this time the loan stuck. In Middle English, the meaning of history was story in general, the restriction to the meaning the branch of knowledge that deals with past events, the formal record or study of past events, esp. 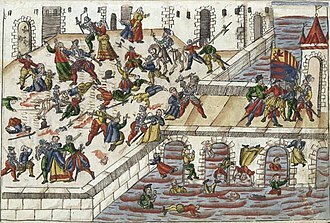 human affairs arose in the mid-fifteenth century. With the Renaissance, older senses of the word were revived, and it was in the Greek sense that Francis Bacon used the term in the sixteenth century. For him, historia was the knowledge of objects determined by space and time, in an expression of the linguistic synthetic vs. analytic/isolating dichotomy, English like Chinese now designates separate words for human history and storytelling in general. Isaac Jan Alexander Gogel was the first minister of finance of the Batavian Republic and the Kingdom of Holland. 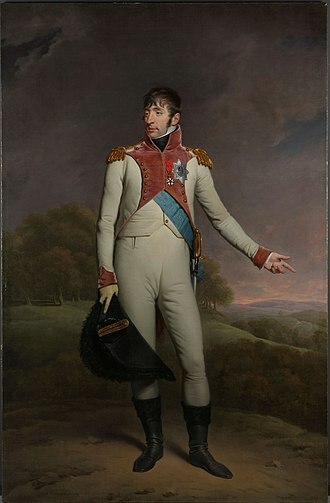 He married Catharina van Hasselt in 1800, and had three children, Gogel was the son of Johan Martin Gogel, a German officer in the service of the army of the Dutch Republic, and of Alexandrina Crul. He had only a formal education and went to Amsterdam to apprentice for a career as a merchant at age 16. He started his own firm in 1791, Gogel was a typical self-made man, a product of the petty-broking and merchandising world of Amsterdam. Though one of the most prominent pioneering Dutch economists, he did not receive an education in this field. As a typical self-taught man he tended to borrow his ideas from all the texts from the day. This caused an enmity toward the rivals of the Patriot party. Even before the Batavian revolution of 1795 and the proclamation of the Batavian Republic he became involved in politics, on a local and national. After the January 22,1798 coup détat by general Herman Willem Daendels, he was appointed agent for finance and he became a member of the Uitvoerend Bewind himself for a short while, till elections had been held for a new Representative Assembly. He was again appointed Agent, this time for Finance, by the new Uitvoerend Bewind and he now started on the reform of the Dutch system of public finance that was long overdue. He attempted to reorganize the tax system, but because this entailed abolition of the old, federal arrangements, besides, he proposed to form a new, national organisation to collect the taxes. 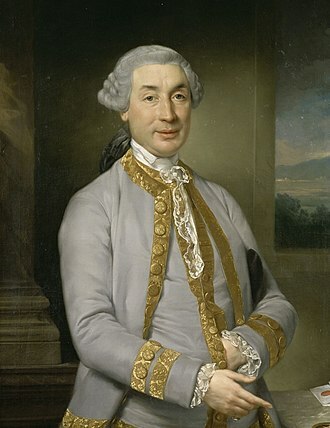 His General-Taxation-Plan legislation was first proposed in 1799, but only enacted on March 25,1801, Gogel was working on adopting many parts of the new revolutionary infrastructure that had recently been put into place in Paris, and one of these was the Louvre. Modelled on that concept, he envisioned a National art gallery for art-lovers and artists alike and he decided on a place and two major types of art, and these were the Huis ten Bosch location with its magnificent Oranjezaal and the concepts historieele and moderne art. Oddly the Rijksmuseum which was founded with this collection at its core. In fact most Catholic or Orangist art galleries had either hidden their collections or taken them away, for his national inventory in 1799 he appointed an inspector for this job, Cornelis Sebille Roos. Johannes, Jan or Johan Vermeer was a Dutch painter who specialized in domestic interior scenes of middle-class life. Vermeer was a successful provincial genre painter in his lifetime. He evidently was not wealthy, leaving his wife and children in debt at his death, Vermeer worked slowly and with great care, and frequently used very expensive pigments. He is particularly renowned for his treatment and use of light in his work. Vermeer painted mostly domestic interior scenes and he was recognized during his lifetime in Delft and The Hague, but his modest celebrity gave way to obscurity after his death. He was barely mentioned in Arnold Houbrakens major source book on 17th-century Dutch painting, since that time, Vermeers reputation has grown, and he is now acknowledged as one of the greatest painters of the Dutch Golden Age. Relatively little was known about Vermeers life until recently and he seems to have been devoted exclusively to his art, living out his life in the city of Delft. Until the 19th century, the sources of information were some registers, a few official documents. John Michael Montias added details on the family from the city archives of Delft in his Artists and Artisans in Delft, Johannes Vermeer was baptized in the Reformed Church on 31 October 1632. His father Reijnier Janszoon was a worker of silk or caffa. 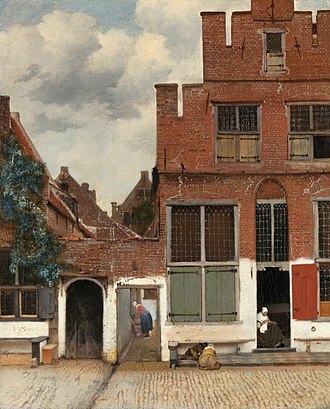 As an apprentice in Amsterdam, Reijnier lived on fashionable Sint Antoniesbreestraat, in 1615, he married Digna Baltus. The couple moved to Delft and had a daughter named Geertruy who was baptized in 1620, in 1625, Reijnier was involved in a fight with a soldier named Willem van Bylandt who died from his wounds five months later. Around this time, Reijnier began dealing in paintings, in 1631, he leased an inn, which he called The Flying Fox. In 1635, he lived on Voldersgracht 25 or 26, in 1641, he bought a larger inn on the market square, named after the Flemish town Mechelen. The acquisition of the inn constituted a financial burden. When Vermeers father died in October 1652, Vermeer took over the operation of the art business. In April 1653, Johannes Reijniersz Vermeer married a Catholic girl, the blessing took place in the quiet nearby village of Schipluiden. Asia covers an area of 44,579,000 square kilometres, about 30% of Earths total land area and 8. 7% of the Earths total surface area. The continent, which has long been home to the majority of the population, was the site of many of the first civilizations. Asia is notable for not only its large size and population. In general terms, Asia is bounded on the east by the Pacific Ocean, on the south by the Indian Ocean, the western boundary with Europe is a historical and cultural construct, as there is no clear physical and geographical separation between them. The most commonly accepted boundaries place Asia to the east of the Suez Canal, the Ural River, and the Ural Mountains, and south of the Caucasus Mountains and India alternated in being the largest economies in the world from 1 to 1800 A. D. The accidental discovery of America by Columbus in search for India demonstrates this deep fascination, the Silk Road became the main East-West trading route in the Asian hitherland while the Straits of Malacca stood as a major sea route. Asia has exhibited economic dynamism as well as robust population growth during the 20th century, given its size and diversity, the concept of Asia—a name dating back to classical antiquity—may actually have more to do with human geography than physical geography. Asia varies greatly across and within its regions with regard to ethnic groups, environments, historical ties, the boundary between Asia and Africa is the Red Sea, the Gulf of Suez, and the Suez Canal. This makes Egypt a transcontinental country, with the Sinai peninsula in Asia, the border between Asia and Europe was historically defined by European academics. In Sweden, five years after Peters death, in 1730 Philip Johan von Strahlenberg published a new atlas proposing the Urals as the border of Asia, the Russians were enthusiastic about the concept, which allowed them to keep their European identity in geography. Tatishchev announced that he had proposed the idea to von Strahlenberg, the latter had suggested the Emba River as the lower boundary. It is in the collection of the Amsterdam Museum but is prominently displayed in the Rijksmuseum as the best known painting in its collection. The Night Watch is one of the most famous Dutch Golden Age paintings and is window 16 in the Canon of Amsterdam, the painting was completed in 1642, at the peak of the Dutch Golden Age. It depicts the eponymous company moving out, led by Captain Frans Banning Cocq and his lieutenant, behind them, the companys colours are carried by the ensign, Jan Visscher Cornelissen. Rembrandt has displayed the emblem of the arquebusiers in a natural way. She is a kind of mascot herself, the claws of a chicken on her belt represent the clauweniers. The man in front of her is wearing a helmet with an oak leaf, the dead chicken is meant to represent a defeated adversary. The colour yellow is associated with victory. Another interpretation proposes that Rembrandt designed this painting with several layers of meaning, the Night Watch is symmetrically divided, firstly to illustrate the union between the Dutch Protestants and the Dutch Catholics, and secondly to evoke the war effort against the Spaniards. 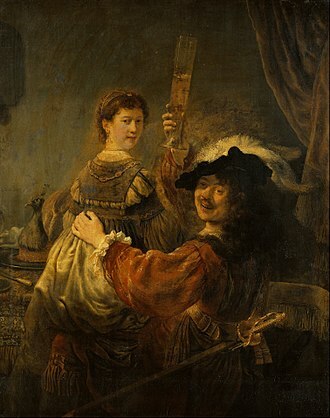 For instance, according to Rembrandts multilayered design, the taller captain symbolizes the Dutch Protestant leadership, all characters of this painting were conceived to present double readings. One of the most important aspects of the Night Watch is that the figures are nearly human size, Rembrandt gives the illusion that the characters jump off the canvas and into real space. For much of its existence, the painting was coated with a dark varnish and this varnish was removed only in the 1940s. In 1715, upon its removal from the Kloveniersdoelen to the Amsterdam Town Hall and this was done, presumably, to fit the painting between two columns and was a common practice before the 19th century. This alteration resulted in the loss of two characters on the side of the painting, the top of the arch, the balustrade. 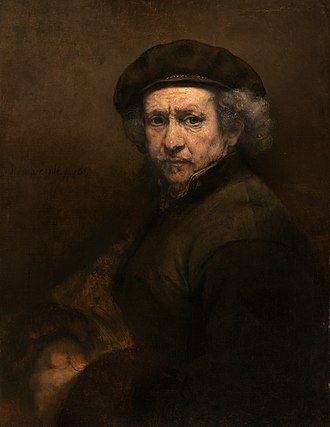 This balustrade and step were key visual tools used by Rembrandt to give the painting a forward motion, a 17th-century copy of the painting by Gerrit Lundens at the National Gallery, London shows the original composition. The Amsterdam Tram is a tram network in Amsterdam, Netherlands. The network dates back to 1875, since 1943, it has been operated by municipal public transport operator GVB, which runs the Amsterdam metro and the city bus and ferry services. The Amsterdam Tram is the largest tram network in the Netherlands, the trams on the network run on standard gauge track. Since 1900, they have been powered by electricity, at 600 V DC, at the terminus station of almost every tram route is a turning loop, so that the route can be operated by unidirectional trams. The only exception is Amstelveen Binnenhof, one of the termini of route 5, as of 2016, there are 14 tram routes. The network comprises a total of 80.5 kilometres of route, the fleet consists of 200 trams, of which 24 are bidirectional for use on the loop-less route 5. On 3 June 1875, Amsterdams first horse-drawn tramway was opened and it linked Plantage with the Leidseplein, and was operated by AOM, which had been founded in 1872 by Karel Herman Schadd, amongst others. By the end of the century, about 15 routes led to or from the Vondelstraat, Willemsparkweg, Linnaeusstraat, Weesperzijde and Ceintuurbaan. The routes of the horse tram lines can still clearly be recognised in the present day tram routes 1,2,3,4,7,9,10 and 13. 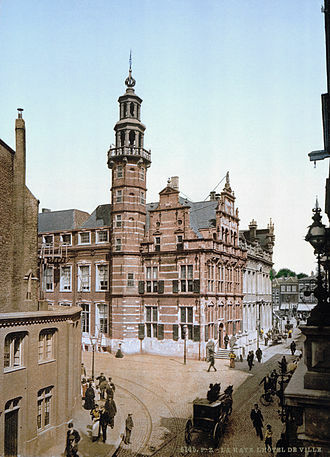 As of 1 January 1900, the municipality of Amsterdam took over AOM, the company continued as the Gemeentetram Amsterdam. A total of 242 tramcars,758 horses and 15 buildings were acquired along with the company, between 1900 and 1906, all but one of the existing tram lines were electrified. Additionally, the AOMs unusual track gauge of 1,422 mm was converted to 1,435 mm standard gauge, by 1906, the electric tram network consisted of 12 tram routes. To operate these routes, the GTA purchased 229 new electric tramcars, the former horse-drawn trams were progressively reclassified as tram trailers. In 1906, the Amsterdamse Tramharmonie orchestra was founded and this orchestra, composed of amateur musicians from the Amsterdam region, still exists. The Buitenhof is a square in The Hague, adjacent to the Binnenhof and the Hofvijver pond. It is listed in the Top 100 Dutch heritage sites, the square originated in the 13th century, during the construction of the Binnenhof. It was filled with houses and stables and, during the reign of Count Albert I, the zoo exhibited mostly falcons and other birds of prey that were used for hunting. Later, hounds were exhibited as well, the Buitenhof was moated for safety in the 15th century. People that did not belong to the court, lived outside of it, around the Plaats and the Korte Voorhout, the only entrance to the square was the Gevangenpoort, Prison Gate. A second entrance was introduced in 1814 with the construction of the Gravenstraat, in 1923, the houses between the gate and the Hofvijver were demolished, as was advised by architect Hendrik Petrus Berlage. This created more space for the traffic, which had had to pass the gate before. Number 19 was built in the half of the 18th century as the main office of the garrison. In the late 19th century, Dam Square was the centre of the horse-drawn tramway network. In 1922, the horses of the Sloten horsecar route were replaced by tram-hauling buses, such as this one in Jacob Marisstraat. A twin axle tram in 1929; this tram type was used until 1968. Hans Rottenhammer, Allegory of the Arts (second half of the 16th century). Gemäldegalerie, Berlin. The Rijksmuseum was designed by Cuypers in a combination of both Renaissance and Gothic styles in the late 1870s. The result is similar to the Hôtel de Ville in Paris in what is considered to be "French Neo-Renaissance" style. However, at the Rijksmuseum the Gothic elements seem to outweigh the Renaissance and the building, despite the English Renaissance quoins, and chateauesque roofs, is sometimes considered to be Neo-Gothic. Queen Beatrix with Prince Claus and their children Constantijn, Willem-Alexander, and Friso on the balcony of the Royal Palace in Amsterdam following the abdication of Queen Juliana, 1980. Queen Beatrix and her son, Willem-Alexander in the Golden Coach on Prinsjesdag 2007, the day she gives the annual speech from the throne outlining the government's agenda for the upcoming parliamentary year. View of Delft (1660–61): "He took a turbulent reality, and made it look like Heaven on earth." 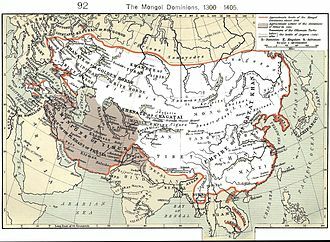 The Mongol Empire at its greatest extent. The gray area is the later Timurid Empire. 18th century copy with indication of the areas cut down in 1715. The Night Watch rolled around a cylinder inside a crate. The canvas would be stored in this condition throughout World War II. Fair on the Buitenhof in 1686. William V, Prince of Orange and his family visit the Buitenhof in 1781. From left to right. Jaap de Hoop Scheffer and wife Jeannine visiting Laura and George W. Bush at the Bush Ranch in Texas in 2007.